I know selective color, highlighting a particular color and keeping the rest in black and white, is a trendy technique. A trend that has long since fallen out of fashion. But when I looked at the full color image, this is what I saw. It was a dreary late afternoon in Tokyo, and the peak fall color had passed, in this place. 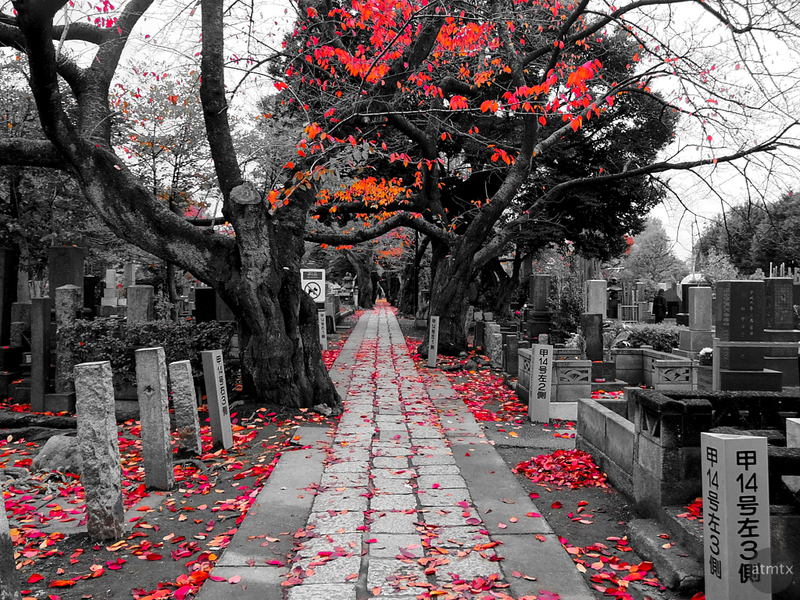 This cemetery, with its contrasty trees and stone path, begged for a black and white treatment, but the loss of the reds would be shameful. The splash of vivid reds amongst texture, contrast and bold shapes makes for an interesting image, I think. On a slightly related note, my migration to a new library management and image processing software is proceeding. I mentioned, as one of my goals for this year, is to finally move off my old Aperture 3 workflow to Capture One. Things are proceeding well and I’m working out many of the inevitable kinks. As expected, there things about Capture One that I like better, but also things that I miss from Aperture. The ability to do sophisticated color processing is one new advantage, which I used to create this image. More observations on Capture One, as I progress. Like many of my Japan photos, I used the Pentax Q7. This time with the standard zoom lens. You mean I missed the whole trend and now, it’s too late? I always intended to learn how to use spot color, but I never quite got around to it and to be honest, while i like it in other people’s pictures, it never quite seemed right for mine. But I like it in yours. The red is just right. I just never got around to it. For a retired person, I am awfully busy!